For the first 9 years in the life of the Mennonite Centre, donations were primarily spent in the former Molotschna colony. Molochansk was the point of distribution and contact for most of the southern villages. In this, our tenth year, the Board has decided to increase our presence in the Zaparozhye/Chortitza areas. In order to better understand the Chortitza areas we took a tour of the former colonies of Chortitza and Yasekovo. Our tour guide was Victor Penner, a recognized local authority of Mennonite life in the former colonies. Victor is neither quiet nor restrained when conducting a tour—he speaks with the intensity of one giving his last tour. He gives you gigabytes of facts, fascinating vignettes, and a critical overview of the impact of the Soviet system. Like Alex Trebek of Jeopardy! he gives the answer first but then asks Why? His is a powerful presentation. Victor's front-wheel-drive Opel four-wheeled its way through back alleys, roads that resemble horizontal moguls, with Victor asking, Why can't these be fixed? Comparing these villages with those of Molotschna, one notices several differences. 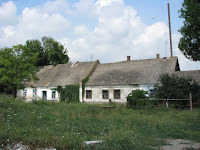 Villages of Chortitza and Yasykovo have older buildings which appear to have suffered less damage during the WWII. Victor explained that the front went through this area more quickly—the longer the battle, the more damage. He showed some fascinating original log houses which seemed reminiscent of the ones we saw in Poland. 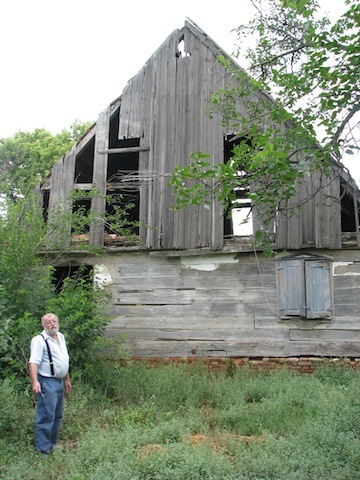 He showed the skeleton of a Mennonite house illustrating how timbers were connected to the brick work. We found several house-barn combinations. In fact, the Mennonite houses in this area seemed to have a common design—perpendicular to the road, main entrance on the side, and two windows in the front gable. 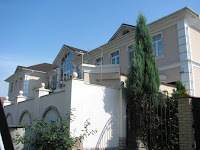 The houses in Molotschna appear to show more diversity. Victor also showed houses built after the civil war in 1917-1923. These houses were smaller and reflected the state of poverty that was already taking over in the Mennonite areas. However, the most significant difference between the two areas is the topography. 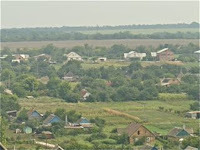 Villages in the Chortitza/Yasykovo area are set in valleys, with pretty big hills on either side. These deep valleys make the Chortitza/Yasykovo area very picturesque, with large sweeping landscapes. A counting of the clay tile roofs of the villages from the top of the hill is inspiring. We suspect that children in these areas would enjoy tobogganing in winter—in Molotschna they would have had to be pulled by horses or cross the Molotschna River and for the climb to the top of Colonista Hill, the ridge which sweeps from Melitopol north, past Molochansk. 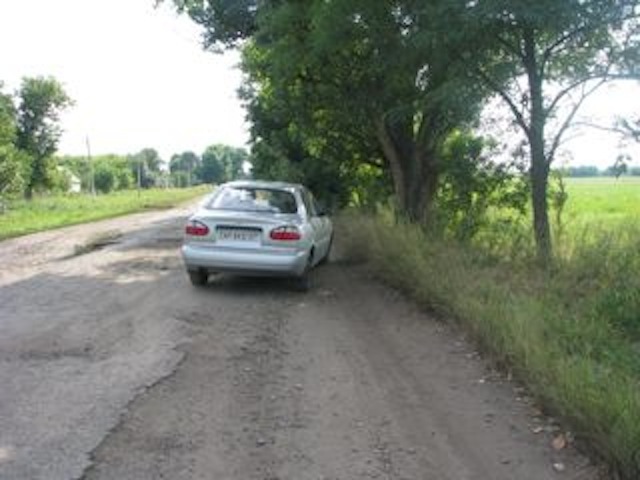 At this point in 2011 we have given about 20% of our project-giving to the Chortitza/Yasekovo area. We have helped schools with new desks, chairs, and sports equipment; we have given support to camps for handicapped and other children; we are supporting a promising young artist from a very poor family; we continue to give support to medical clinics in some of the smaller villages. 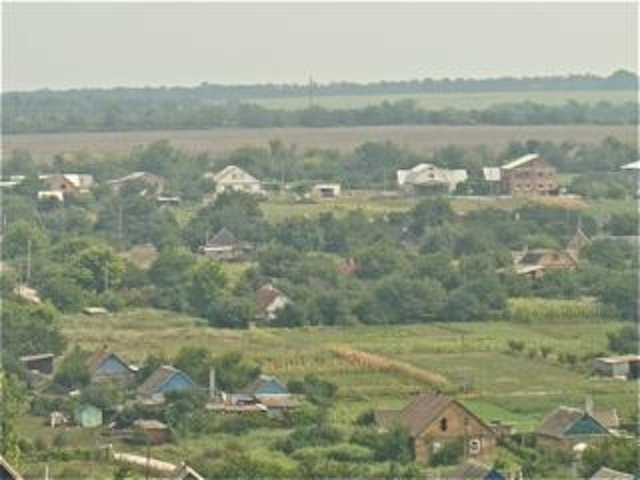 One of the major influences separating Chortitza and Molochansk villages is the impact of Zaparozhye, a major city that encompasses much of Chortitza. 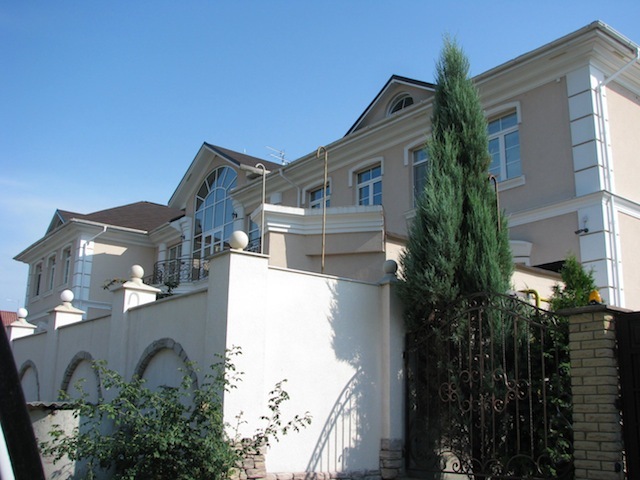 The continued growth and increased wealth in Zaparozhye has resulted in the nouveau riche buying up much of the land in Nieder Chortitza. These are the new “estates”, but as Victor points out, unlike previous estate owners they appear to give little concern to the development of the surrounding community. While these houses are hidden behind fancy copper-sculptured gates and 10-foot brick walls, the public roads in front of them are as bad as all the village roads. They exhude wealth but show fear, their brick walls so tight to the roads that there is no room for friendly neighbourly visiting-benches. This is our final blog for 2011. We will be coming out with a fall newsletter which will report on the projects that we have been undertaking. Hopefully our reports have given you a picture of our lives here. If you wish to contribute to the work of the Mennonite Centre in Ukraine make your Canadian cheques to "Friends of the Mennonite Centre in Ukraine" or "FOMCU." Cheques from American donors should be made out to "MFC-FOMCU". All cheques should be mailed to George Dyck, Treasurer, 3675 North Service Rd, Beamsville, Ontario, Canada - L0R 1B1. Check our website at http://www.mennonitecentre.ca/ for information on credit card donations.